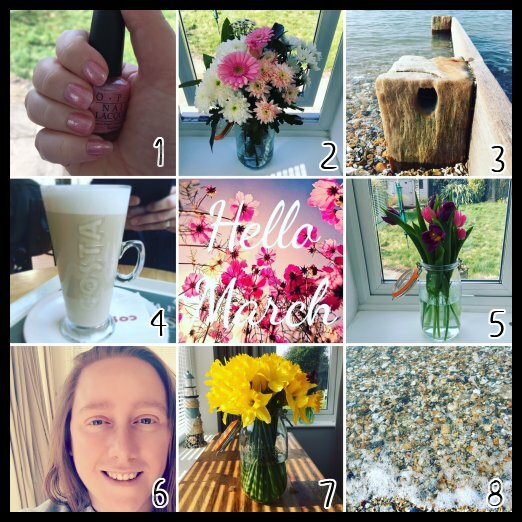 As we’re coming to the end of March it definitely feels like Spring is in the air now and I think this months pictures reflect this. All of these photographs are taken from my Instagram feel free to give me a cheeky follow! Now on to the roundup! I won employee of the month for February and the prize is a £100 Debenhams voucher. One of the things I treated myself to was a new OPI. This one is called Princesses Rule and is so pretty, pink and girly! I love it. This month I have become obsessed with having fresh flowers in the house. This is the Spring Bouquet by Tesco. I still have these a week later and they’re looking as perfect as when I bought them. Someone complained that my Instagram is all beaches, nails and sunsets. I won’t apologise for living in a very photogenic location. We went to London this month but unfortunately I was too ill to enjoy it fully. A lovely Costa Coffee helped cheer me up whilst we were there though! More fresh flowers, this time from the local florist. I love tulips, they’re one of my favourite flowers. I’ve been doing lots of reading up on how to make a good blog, one tip was to have a recent photograph of yourself and so here you have it. I used a snapchat filter to make my skin look better! Not got me on snapchat yet? I’m @bigmugoftea on there too. Daffodils are a sure sign of Spring and I think they look fantastic in my Kilner jars. I’m currently obsessed with Kilner! Just another beach shot. It’s been so warm lately I’ve spent a lot of time down there. April brings with it even better weather (hopefully) and lighter evenings!